Brigitte’s story illustrates that holistic health and well-being require coordinated comprehensive care. Brigitte is a mother of four children living in Masina 2. After her husband died of AIDS-related causes, and she and her 15-year old son shared that they are also living with HIV, they were rejected by her family and left without support. All she needed was an invitation and an opportunity — Brigitte soon turned this into a stronger financial future for her family. At the Sante Bora health center, Brigitte was referred to a support group where a 4Children field agent urged participants to join a SILC group. All she needed was an invitation and an opportunity — Brigitte soon turned this into a stronger financial future for her family. After four months of savings in the group, she was contributing 30,000Fc ($19) and obtained a loan of 60,000Fc ($38) to start a small vegetable business. 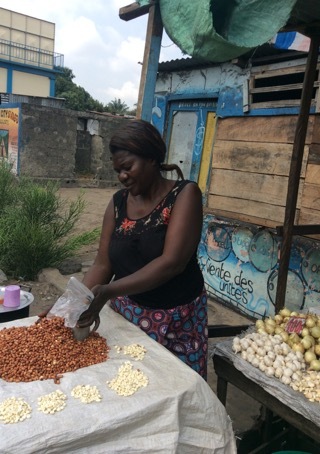 One month after paying back the first loan, the group granted her a second loan that was three times the amount of the first and she was able to increase the variety and value of the items that she sells to include peanut oil, corn, and rice. From her earnings, she has been able to maintain regular savings with the group and her dream is to continue increasing the contributions she makes until she can fully fund her children’s education. A 4Children case manager visits Brigitte regularly in her home to connect her with other resources. Brigette received a cash transfer of $60/month for six months. The direct support allowed her to move out of her sheet metal and wooden structure to build a small house of more resilient materials. The case manager has been able to support Brigitte in maintaining her treatment and was able to encourage her 15-year-old son, who had stopped taking his medication, to attend a teen support group at the health center. Thanks to coordinated and comprehensive care, Brigitte’s family has improved health and housing as well as secured income, savings and schooling.